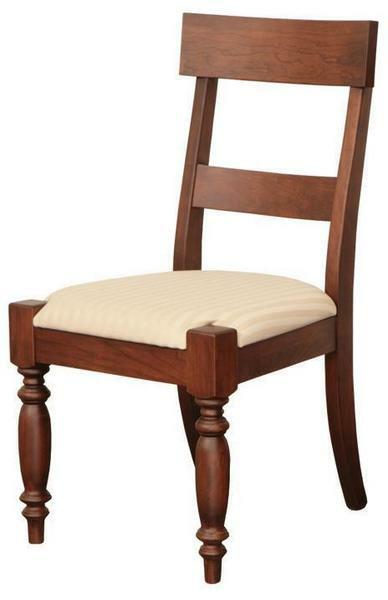 Introduce a fresh, new look for your dining room with our Amish made Oceanside Dining Room Chair. With formal style flair and an upholstered seat that's sure to keep you comfy at dinner, this dining chair is built to please. This is a solid wood dining chair ready to serve for years to come. The front legs are turned with the curves of formal style and the back legs are slender and straight with a gentle backwards curve. A top chair band contours to your back while a slender lower band offers additional support. From our lovely Lincoln Collection, the Oceanside is American made solid wood furniture to be proud of. Choose from oak, cherry, quarter sawn white oak as well as rustic cherry wood for your custom dining chairs. This dining chair is available with or without arms and makes a lovely match with the Amish Oceanside Dining Room Leg Table and the Amish Oceanside Hutch with Wine Rack Buffet. We're excited for the building of your new dining chairs to begin. We offer complete dining room sets on our popular Shop the Look Dining Room page and we invite you to get in touch with any questions. Our Amish Furniture Specialists are here to help you. Thank you for shopping with DutchCrafters. Top of Chair to Floor: 37"